In recent years, the market has been offering a wide variety of traditional boats designed to satisfy the tastes of the 90's. This mixture of tradition and innovation coincided with new investments that maintained shipyard activity alive during the crisis of this sector. 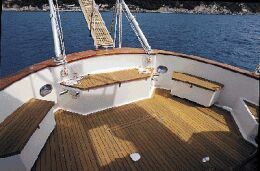 For the construction of this new 40 footer, the Ligurian Sciallino family used its traditional experience to build a boat with a modern line and special design and finishing. We tested the boat in Andora (Italy). 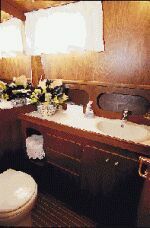 At first glance, she lured us with the perfume of her mahogany essence interiors and with the classical elegance of her solid teak deck and cockpit. The Sciallino 40 is fitted with two helm stations and it perfectly illustrates the tastes of a tradition-loving owner: seakeeping ability, performance capability, comfort, marine atmosphere and the touch of elegance that everybody notices when approaching the boat from the dock. 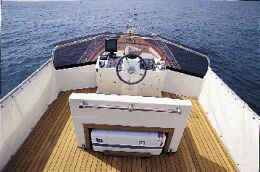 This semi-displacement boat reached the maximum speed of 27 knots with four persons on board, fully fitted, loaded with water and fuel thus showing how well designed is the hull line of the Sciallino project. Price with standard fittings and test power: Lit. 472,000,000 ex VAT. 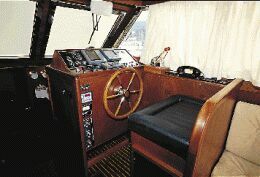 Flying bridge: second fully equipped helm station, life raft storing arrangement, weathertight light alloy hatch with access ladder from the cockpit. Stainless steel roll-bar and windshield with tempered glass. Galley: L-shaped galley, with mahogany wood cabinets, Formica worktop fitted with several lockers. Opening side porthole. Standard fittings: battery charger and feeders with 220V dockside electric connections and electric shock saver, navigation lights and remote control long-distance search light, 33 lbs. 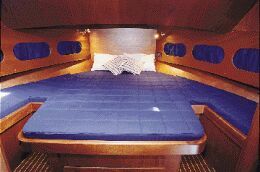 anchor with 246'-long anchor chain, windshield cover, porthole mosquito nets, interior cushions and curtains, fenders and customized fender covers, name on aft transom. 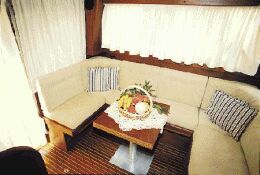 Optional fittings: auto-pilot, two GRP locker settees with solid teak cover for live bait or ice box, safety equipment as per regulations, echo-sounder, electrical oven in the galley, GPS, diesel generator, hydraulic gangway, teak deck and gunwale, radar, stereo, VHF. Docking maneuverability: engine throttle and reversing gear lever. The boat responds very well to the pilot's minimal actions. 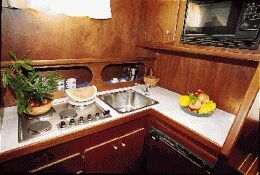 Galley: galley is ample, with moderate ventilation and it is very well arranged. It is fully fitted with the essential household appliances. Range and sink are at suitable height level. Bathrooms: finely decorated and fitted with lockers. Electrical panel: easy access, with good indication of main switches and with good-quality cable connections. the difficult access from the cockpit to the aft swimming platform, the small and steep ladder to the flying bridge and the simple arrangement of the same.